Serapio's (formerly known as Don Serapio's) seems to stay in business as much from its loyal customers who trek the thirty or so miles from Oklahoma City as from the local population in the quiet community of El Reno and the surrounding agricultural area. In operation since 1981, Serapio's spent the first portion of that time on North May Avenue in Oklahoma City, where many of its customers came to know and appreciate the fresh food and family run operation. 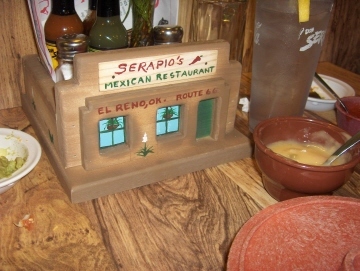 The family's restaurant experience began in 1954 with the popular El Rancho Sanchez chain that was one of OKC's pioneer Tex-Mex restaurants, and they continue the family recipes at Serapio's. To me coming to Serapio's is like stepping back in time to experience the Mexican food with which I grew up. Serapio's is not stuck in the past, though, and has added new dishes and broadened the menu to include authentic style Mexican food as well as the traditional Tex-Mex menu. Normally my favorite Mexican restaurants are those which come the closest to serving the same food that is found in Mexico, regardless of the region that is represented. I have found a few things at Serapio's that I thought were quite authentic, and the waiters seemed quite knowledgeable about pointing them out to customers (the owners are almost always present as well, and will also give good advice). In Oklahoma, though, several of the old time Mexican restaurants (and a small number of the new ones) carry on the tradition of a style of Tex-Mex cooking that is close to the style served in central and south Texas. While I do not call this "authentic" Mexican food, Tex-Mex is a recognized American branch of Mexican cooking, and I think Serapio's is one of the best examples to be found in Oklahoma. Besides El Rancho Sanchez, many of us remember the old El Charrito Restaurant that was one of the pioneers in Oklahoma Tex-Mex food. These were the "holy grail" of old style Mexican food, serving food that was simple, freshly made, and flavorful rather than than the mass-produced, Anglocized dishes served in what seems to be many of the chains, and some of the places that serve the same type of food but do not take the same care in preparing it. Serapio's is well known around Oklahoma City for its tortillas, which are always freshly made. The chips are not quite as noteworthy, but it is nice to find a place where they are enjoyable and fresh. The Salsa had a rather unusual flavor, but was still pretty decent. 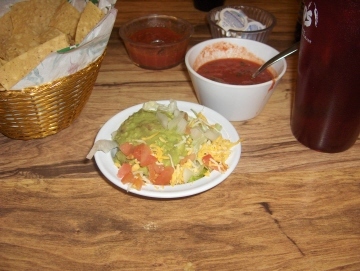 I really think this is not the same salsa that used to be served at the "old" restaurants (El Charrito and El Rancho Sanchez), but this is a minor thing, and a spicier salsa is available on request. 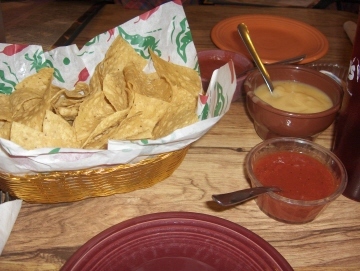 The complimentary Queso tasted great with chips, and shows how even something that is not a great example of true Mexican food can be made good when the owners take the time to make it fresh. Although Serapio's purposely keeps the spice level almost non-existent for a region of Oklahoma that is notorious for its lack of authentic ethnic and spicy eateries, a Special Salsa is available on request that I would say probably makes the food at least twice as enjoyable as it would be at the Tex-Mex places that only serve the bland, Americanized salsa. This salsa seemed to have its share of jalapeños, but had a complex flavor that is typical of the more authentic Mexican restaurants. Cheese Enchiladas are one of the major features of any Tex-Mex restaurant, and the ones here are pretty typical of the cuisine at Serapio's with not much more than a tortilla, melted cheese, and chile con carne on top. They do not need to be very complicated, though, since people enjoy them for their freshness. Topped with chili sauce made with ground beef (not the New Mexico style chile sauce that is spicy), I think the enchiladas at Serapio's give a very good introduction to Oklahoma style gooey and cheesy Tex-Mex food. I think one of the secrets to it is that they use good quality beef. The Refried Beans are quite fresh, and the Rice is especially flavorful. The Guacamole was quite bland, and I did not think the yellow cheese and onions went well with it. This is one dish that I think travelers on Interstate 40 will find to be better when they get farther west (New Mexico or beyond). I do not remember Chicken Mole ever being part of the menu at the old Tex-Mex restaurants, but it is definitely an authentic Mexican dish. 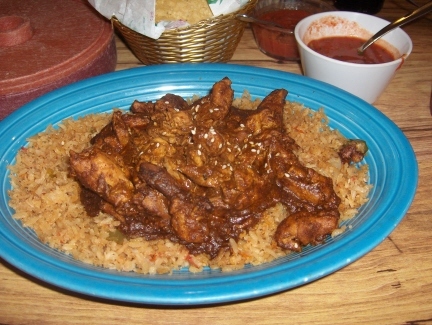 Different styles of mole are prepared in different regions of Mexico, and I think the one served at Serapio's is a northern style dish (Tex-Mex food originated with immigrants from the Monterrey area). The mole sauce was lighter and less spicy than others I have tried, and I thoroughly enjoyed it, even though my preference is still for darker mole. Chicken breast meat was used, the type of meat I have seen in most restaurants. I have found several restaurants in Oklahoma that serve good mole, and I include Serapio's in this group. A Sopaipilla is served free with every meal for dessert, either plain or with sugar and cinnamon. Being used to New Mexico sopaipillas, though, I would prefer that Serapio's dispense with this freshly cooked but non-fluffy pastry in favor of slightly lower prices. I personally do not feel that the sopaipilla is the high point of the meal at Serapio's. Knowing that the family members are always present to oversee the operation and to make customers feel at home is a high point of any meal at Serapio's.